St Joseph’s Miltown Malbay will take on Dr Crokes in the Munster football club final in a fortnight. 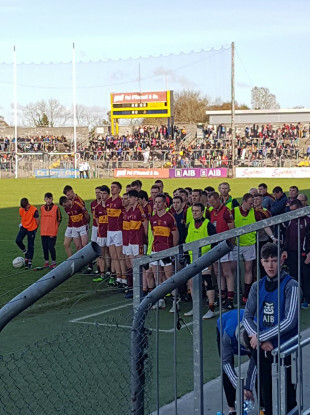 Miltown pictured before the national anthem at the Clare Championship final at the end of October. SECOND HALF GOALS from Cormac Murray and Sean Malone fired St Joseph’s Miltown Malbay into their first Munster senior football final in torrential rain at Fraher Field. The Clare champions mastered the horrendous conditions to set up a provincial final against Dr Crokes on 25 November. The maroon and gold outscored The Nire 5-1 in the second quarter to open a 9-5 half time lead. They had six scorers with , Eoin Cleary and Kieran Malone on target twice. The teams were deadlocked at four points each after 18 minutes. St Joseph’s shot stopper Sean O’Brien saved with his feet from Conor Gleeson. Five in a row by Oisin Looney, Kieran Malone, Cormac Murray, Conor Cleary and Colin Hehir put them in control of this contest. The away side also kicked eight wides and Murray shot across the face of the goal. A Gleeson free, The Nire’s first point in fourteen minutes, was the last score of the opening half. Sweeper Brian Curtin curtailed their attacking threat. As the rain teemed down, Shane Walsh shaved the deficit to three but that was as close as the Waterford winners got. On 41 minutes, Murray capitalised on a slip in the Nire back line and thumped the ball to the top corner. Jamie Barron, the leading light for the locals, knocked over two points in response but they wouldn’t score again. St Joseph’s sub Sean Malone found the bottom corner with ten minutes left to bury their opponents. Tom Barron had a late penalty appeal waved away by referee Padraig O’Sullivan, much to the annoyance of Nire players and management. Darren Guiry was booked for his protests. The Kerry official also dismissed James McGrath on two yellows but quickly realised that he had made a mistake and invited the defender back on the field. An injury time free from Clare star Eoin Cleary sealed victory for the visitors. Scorers for St Joseph’s Miltown Malbay: Cormac Murray 1-1, Sean Malone 1-0, Eoin Cleary 0-3 (3fs), Colin Hehir, Kieran Malone 0-2 each, Oisin Looney, Conor Cleary, Eoin Curtin 0-1 each. Scorers for The Nire: Jamie Barron 0-3, Conor Gleeson 0-2 (1f), Tom Barron, Dylan Guiry, Shane Walsh, Shane Ryan (f) 0-1 each. Email “History made as Miltown Malbay book first ever Munster football final spot against Dr Crokes”. Feedback on “History made as Miltown Malbay book first ever Munster football final spot against Dr Crokes”.